Character actor Harry Dean Stanton certainly kept himself busy throughout his life; his IMDb page alone lists just over 200 credits to his name, across a career spanning six decades, with appearances in nearly everything from Cool Hand Luke to The Godfather Part II to Alien to The Last Temptation of Christ to The Green Mile to so many other films that if I were to list even half of them, it would take up the majority of this review. Not a bad resume to bow out on, and bow out he did last year when he passed away at the grand old age of 91, leaving behind one hell of an extended on-screen legacy. His chameleon-like ability to slip into a character’s skin and give him his own set of quirks and eccentricities, regardless of how big or small the role is, can be seen in full force during what has turned out to be his final lead performance, that of the title character in debut director John Carroll Lynch’s Lucky, a quiet little film that speaks volumes thanks to Stanton’s raw, and even eternal, talent. In the film, Stanton is Lucky, an elderly gentleman and war veteran – he served as a cook during his time in the Navy – living alone on the outskirts of a quiet desert town. He’s in top physical shape for someone his age, despite his frequent habit of smoking cigarettes, and everyone in the town knows him as the old but harmless curmudgeon who’s set in his ways. Soon, though, Lucky has a sudden fall in his home, and although he is given the all-clear by the doctor, it kicks off a small crisis of mortality that causes him to question everything he thinks he knows, and to make peace with the fact that one day, eventually, he is going to finally pass on. Lucky is one of those movies where nothing grand or interesting ever happens; there are no big plot twists or even any dramatic confrontations in this movie, where the two biggest scenarios are that Lucky’s friend Howard (David Lynch) is mourning over his missing pet tortoise named President Roosevelt, and that Lucky can’t light up a cigarette inside a public place. The thing is, though, while the fact that nothing happens here sounds like it’s a knock against the film, it actually helps establish a calm and grounded environment, the kind where the everyday lives of these townsfolk, Lucky included, are presented not as dramatically engaging but more like a snapshot of people who are content with the small, unshowy lives that they lead. It reminded me a lot of Paterson from a couple of years ago, a movie that also had no major dramatic stakes to it and was just a week in the lives of some very ordinary but very content people, which in many ways made it more three-dimensional and engaging than some of the more structured dramas out there because they felt like real people you could bump into randomly as you go about your day and strike up an amiable conversation with; the same can be said with Lucky, which also features a whole bunch of interesting characters, even if you don’t always end up agreeing with some of their philosophies, who you wouldn’t mind spending a bit of time with because they all have different stories to tell that you really want to know more about. There’s a scene where Tom Skerritt pops up for just the one scene and swaps war stories with Lucky in a café, and the details which he describes during a particularly disturbing encounter during the Okinawa invasion of World War II are the kind that will really stick in your imagination long after he’s gone, and it’s delivered so well by this character that you’re actually disappointed he’s not in the movie anymore after that, because you want to know a hell of a lot more about this guy and what other things he saw whilst serving his country. The movie is filled with little character-driven vignettes like that, and while not everyone will like how there is no traditional narrative structure to this film, they will at the very least be captivated by the simplicity and content nature of these people occupying the screen. It’s a script – co-written by Logan Sparks, a close friend of Stanton’s as well as his long-time PA – that really depends on the lead performance being strong enough to carry it even though there’s nothing to carry it over, and luckily Harry Dean Stanton delivers a solid enough performance to rest it all on his somewhat fragile – and, sadly, soon to be non-active – shoulders. The character of Lucky appears to be tailor-made for Stanton and the actor fits into it perfectly like the comfiest pair of socks you could give a man in his golden years, trading fun quips with the several characters he bumps into along the way, having some quietly emotional moments when required, and in one memorable scene singing a spontaneous song in Spanish at a friend’s fiesta that’s subtle in its powerful nature. As you learn a little more about this guy and what kind of life he led up to this point, the more you feel a tragic sense of loneliness to his being and his aching desire for some kind of human contact, whether it be brief small-talk or rude insults to a lawyer (Ron Livingston) who’s just there to do his job. Stanton achieves all that with all the acting power he has left in his system, and he does so in ways that will really make you realise what a talent it was that we lost just over a year ago. It’s a quiet and slight movie that’s certainly driven by the writing that gives us many interesting characters to glimpse at, as well as a captivating lead performance by an actor who might not be around anymore, but who we should all count ourselves lucky that he at least went out with one hell of a good movie. 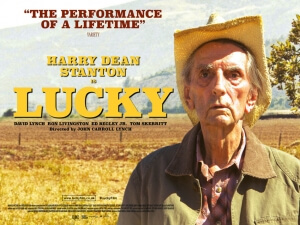 Lucky makes up for its lack of a traditional narrative with a script that features several interesting characters we’d like to know more about, least of all the titular character played wonderfully by the late Harry Dean Stanton.